Jessica Honaker (left) and Kristie Reddick (right) are entomologists who teach kids about insects, spiders and other arthropods. Most of the country first heard of The Bug Chicks from their TV commercial with Microsoft, which is marketing Windows 10 by sharing how the bug-focused nano-business uses its software. 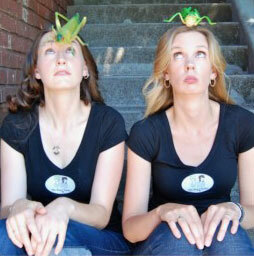 Kristie Reddick and Jessica (Jess) Honaker, aka The Bug Chicks, are “entomologists who teach about the incredible world of insects, spiders and other arthropods,” according to their website. The website is aimed towards parents and teachers of students and young aspiring entomologists, or junior entomologists. Based in Portland, Ore., The Bug Chicks are well qualified “bugdorks,” as they call it. They both have master’s degrees in entomology from Texas A&M University and have worked with the U.S. Forest Service, Norman Borlaug Institute of International Agriculture and National Ag Science Center, among others. The pair produces videos and resources for bugdorks, and also travels to schools, libraries, camps, museums and festivals to try to change the way kids think about bugs. The fun, upbeat videos cleverly cover a breadth of topics, including mating, bees, ants, wasps, beetles, lice and pollination. The video “Entomology in One Word” shares with young students interested in entomology the words that entomologists use to describe their profession. The professionals share a positive outlook of a career in entomology, using words like happiness, fun, exciting, hope, indispensable, exterminate, fascinating, collaborate, outstanding, opportunity, discovery and employable. Kristie and Jess recently traveled across the country to film arthropods. Their new Sofa Safari Series, which the website says will debut soon, will “explore America’s backyard wilderness.” To be a part of the new Web series, The Bug Chicks are asking bugdorks to upload photos to Project Noah, a mobile app supported by National Geographic where a network of citizen scientists, professionals and nature enthusiasts can share wildlife discoveries. The website also hosts a shop of “Bug Chicks Approved” books, videos, equipment and supplies for purchase. A percentage of purchases through the system goes to The Bug Chicks. Who knew two women entomologists could have this much fun with bugs?